Mobile data traffic has been growing at an unprecedented pace and is increasingly outstripping the network capacity. This rapid growth of data traffic from smartphones and tablets highlights the need to offload traffic to smaller cells. Offloading data to complementary networks promises to be an opportunity for the network operators to reduce the capacity issue as discussed in one of my previous mobile data posts. Having said that, it is important for the operators to realize that despite the implementation of offloading measures, migration of data traffic from fixed to mobile will increase the strain on the cellular network. The industry refers this migration of data traffic as data onload and even though data offload alleviates some of the operator’s network congestion, a significant proportion of the offload could itself be offset by fixed to mobile migration of data. Therefore, operators need to view offloading solutions as complementary to their network, providing them with more strategic opportunities. As a matter of fact, by 2015 it is believed that 63% of the mobile data traffic generated by Smartphones, Featurephones and Tablets – equivalent to almost 11 billion movie downloads – will move across to Wi-Fi and Femtocell networks. Data traffic does not need to be carried on expensive 3G or 4G mobile networks. According to BNP Paribas and Arthur D Little, hiking CapEx to boost network capacity, while users continue to look for ever cheaper flat rate tariffs, is far from the best solution. They believe that a good path is to offload as much traffic as possible from the mobile network onto cheaper, less constrained fixed infrastructure through WiFi or femtocells. Throughout Europe, millions of homes and dozens of thousands of offices and other locations (coffee shops, airports, train stations, universities, etc.) are equipped with WiFi hotspots, and more and more devices generating high traffic loads are now WiFi- enabled: laptops of course, but also smartphones (iPhone, Blackberry, many Nokia phones). Moreover, as shown in the table below, a large share of mobile internet usage takes place either at home (around 40%) or at work (around 20%). Figure: Percentage of mobile Internet usage per different locations. Hence a very significant share of the mobile data traffic can actually be carried over WiFi into the fixed broadband network rather than through the mobile macro-cell network. As shown in the table below, research by Cisco shows that in Europe, 25– 30% of the mobile internet traffic could be offloaded to fixed-line as of 2010. This is already happening in a big way today at several large operators in countries such as France and the UK – with operators saying that 25–50% of their iPhone traffic is actually carried over WiFi. Vodafone recently said that it is now offloading data traffic to WiFi or femtocells in six European countries. Most companies we talked to believe that this is going to develop strongly in the coming years. 3. A focused solution. Operators say that a very small portion of their clients generate a very large share of data traffic: one operator said 8–10% generate 80% of the traffic. This means that if the operator is able to make sure that these customers are equipped with either a solution to offload their traffic at home (either a WiFi box or a femtocell), the return for the operator is great and the quality perceived by other customers is strongly improved. Financially speaking, BNP Paribas and ADL believe that offloading traffic onto fixed broadband strongly reduces the risk of capex step-up (and OpFCF step-down) for mobile operators. The chart below shows that assuming a 30% offload could increase the sector’s long term OpFCF by 4%, or to put things the other way around, the sector could cope with 50% more data traffic for the same amount of capex (e.g. 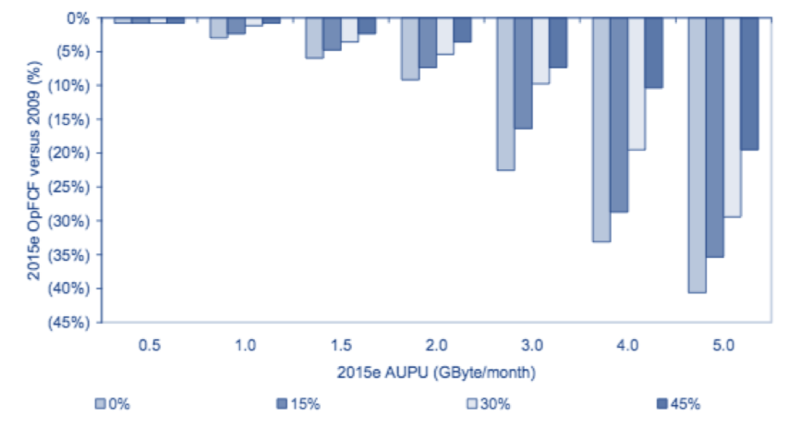 a scenario with AUPU of 3GB could be sustained while maintaining capex & OpFCF trends as if AUPU was 2GB). Figure: Sector 2015e OpFCF versus 2009 depending on the % of traffic offloaded to fixed line. Every mobile operator can do it but integrated operators have an edge. Any mobile device with WiFi capability can connect to a customer’s home (or office) WiFi broadband box without the broadband operator knowing or the customer paying a supplement. This is also true for femtocells: E.g. Vodafone UK is selling such devices that can be connected to any broadband line. Outside the home, it can be done through commercial deals with specialised WiFi operators such as The Cloud, which has particularly large WiFi hotspot presence in the UK, the Nordics and Germany or Fon, perhaps the biggest WiFi network in the world with presence in Spain, USA, Japan, UK or Portugal and a long laundry list of more than 50 countries. Commercially speaking, being able to offer such bundled fixed- mobile services could therefore become a must-have for mobile operators on certain key market segments such as families. The cost-effectiveness of the network will also be a differentiating factor: as data traffic grows strongly, it is becoming essential to carry the traffic at the lowest possible cost – implying that operators having invested ahead of the pack in HSPA coverage and upgrades will be at a competitive advantage. In many countries, challengers have underinvested in 3G networks compared to leaders, as they have lower financial means and most have tried to protect their cash-flows in the recession. This is (or was) true for instance in France and Germany, where the 3G coverage of Bouygues Telecom, E-Plus and O2 Germany have historically lagged that of Orange, SFR, T-Mobile and Vodafone. Conclusion 1: The business case improves further as data use continues to increase and as operators move from purely coverage-driven femtocell deployments to ones based on macrocell-offload, performance enhancement, and personalized home-zone and office-zone services. Home-zone and office-zone services, which are included only in a few of the analyses in this report – principally in connection with the enterprise – will provide significant additional upside. Conclusion 2: In all of the 3G and next generation cases studied using a customer lifetime value approach, the macrocell-off load network savings exceed the cost of the femtocell. As part of this study we identified four basic customer segments, ranging from the Socially Networked Family to the Communications Enabled Firm. While the exact definition of each segment varies, they share several attributes, most notably they have widely adopted smartphones and other data-centric devices (e.g., embedded notebooks, USB dongles and MIDs), and they have an appetite for generating lots of mobile data traffic. To be specific, it I assumed that by 2013 the average monthly mobile data usage of laptops is 5 GB while the average monthly data usage of smartphones is 500 MB. While 500 MBs per month of smartphone usage represents an order of magnitude jump from our business case last year, some trend-watchers consider it rather conservative. Further, we assume that the wholesale cost of the femtocell reaches more attractive price points than those we assumed in our first whitepaper as the market develops and as economies of scale are reached. The combination of these two factors – higher data usage, which can be offloaded via femtocells, and lower-cost femtocells – is what drives this conclusion. Conclusion 3: An operator offering either 3G or dual-mode LTE/HSPA femtocells is able to realize a return of 10 times on their LTE/HSPA femtocell service investment across a wide range of mobile broadband customers. In the first whitepaper, the focus was exclusively on the customer lifetime value for a given customer segment. In reality, an operator is going to ulti- mately target numerous customer segments, perhaps going after each segment with a slightly different strategy and service offering. Conclusion 4: A business case exists even for a regional operator deploying only a few thousand femto- cells. Many smaller regional operators, in addition to the large multi-national operators, are interested in deploying femtocells. However, for the smaller regional operators, the upfront investment can be more critical since the number of femtocell subscribers that they can sign up will obviously be fewer than what it would be for a large operator. Conclusion 5: A new entrant or incumbent deploying LTE or Mobile WiMAX can dramatically improve the customer experience by providing each new subscriber with a femtocell. One of the challenges associated with deploying LTE or Mobile WiMAX is that it requires the deploy- ment of a brand new network, and typically at a higher frequency band, which necessitates additional cell sites for basic coverage purposes. As an alternative to building out a full next- generation network across all regions of the network on day one, the operator could leverage femtocells during the initial network rollout to curtail the need for deep in-building penetration from the macro cell sites in certain non-critical areas within its network. I was reading your very interesting post, and was wondering if the these products are considered as “femtocell” products to offload 3G traffic. I’m providing these products to mobily and STC, as we are the ME, Africa partners for Cradlepoint. On the other hand, if those products or like ones used by Vodafone in UK are considered as solutions, how can they really offload traffic from 3G and 4G networks? As their WAN is still going to be 3G/4G network. The chart implies that ALL increased consumption leads to a decline in OFCF. Is the implication or assumption that carriers are NOT able to collect revenues on incremental usage? That doesn’t make sense.